Vox Theatre - Blog: Panda in the building! In late May, Heather and Mike said "I do" and celebrated at the Vox Theatre with 280guests. 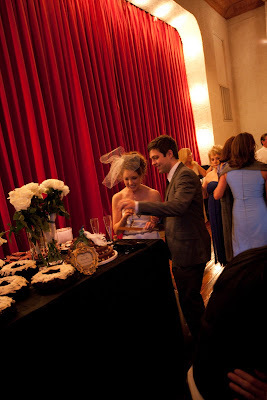 Eventhought it was just our second wedding, I felt I had things under control and it going to run without any surprises. Then it happened - wild animals in the Vox! We have had some animals here and even some wild parties, but until the panda showed up we have never seen wild animals. I should have asked, but I didn't want to look crazy (crazier than I usually do) Yes, Heather and Mike had a panda show up at their reception. Luckily, it was caught on camera or nobody would believe me. 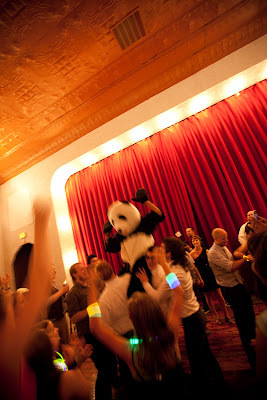 The panda showed up and danced with the guests, was carried around by several of the guests and then mysteriously disappeared. It is something I will never forgot. Do we have to seat Uncle Fred?